Our solutions are always tailored to our customers’ needs. If the extreme flexibility of our machines should prove not to be appropriate for a particular job, we will adapt them through changes in our own developments or new components to the respective situation. That’s what we call efficiency! Industry-independant flexibility, second to none worldwide. 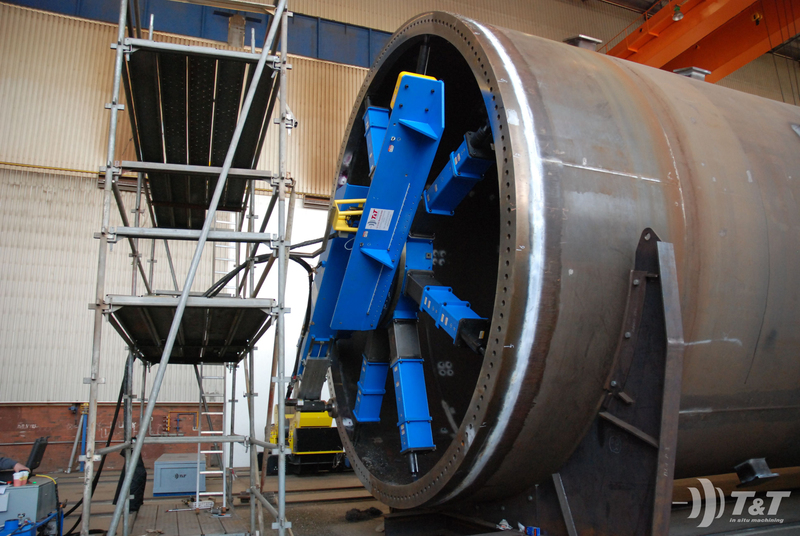 On-site mobile machining brings with it many different challenges. However, every project has one thing in common: no two are alike! That means that in addition to personnel having to be special, the machines used have to be extremely adaptable. Our extensive range of machinery is actually made up of relatively few different kinds of machines. Yet, each of them can be utilized in the most highly varied ways with the respective workpieces on which they are mounted. Further details regarding our services and mobile machinery offered around the world are listed below. The applications shown, however, only give a small glimpse into the many uses possible. For further details, simply contact one of our contact persons. Small pipe flanges or large slewing ring landing faces. It doesn’t matter! Flanges are essential components of the most diverse assemblies and installations. These may involve simple or high-density pipe connections in the petrochemical industry, support surfaces for sprockets on cranes, or also rolling bearings for the Turretrohr [turret tube]?? of a FPSO ship. It doesn’t really matter what kind of flange we’re talking about. Thanks to the range of machinery available, consisting of three surfacing lathes and a circular milling machine with a high-precision positioning system we can drill bolt-holes with a broad number of diameters. Onshore, as well as offshore. The machines mentioned are able to deal with round flanges, however, with our mobile milling machines, of course, rectangular flanges are also no problem. And when the job requires, without time-consuming conversion after boring out a hole with our mobile drilling equipment, we can mill the plane surface in-axis at the appropriate angle. More machines already in development! Flange facing of a slewing ring landing face on a crane. The AX48/120 machines flanges diameter 1.200mm up to 3.500mm through turning. 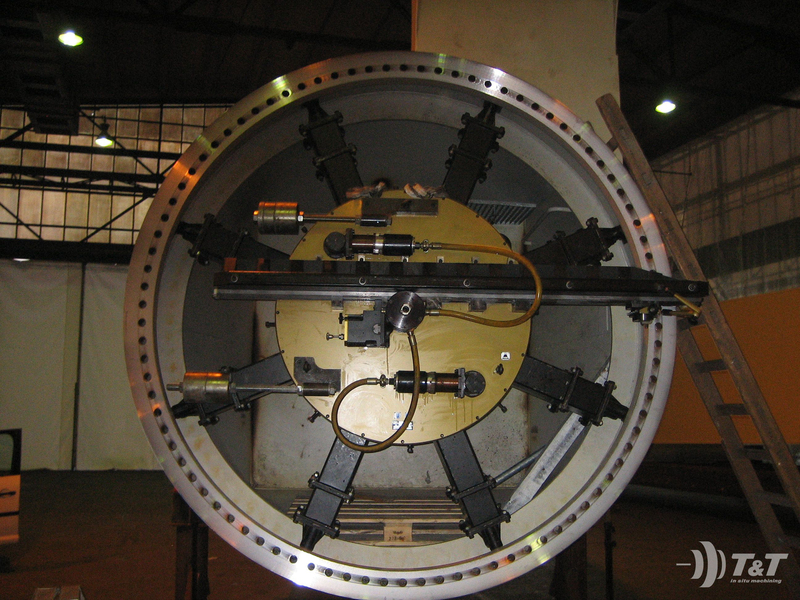 After a maximum time of 10-12 hours one flange in a commom diameter of 3.000mm is machined completely machined. Overall flatness after machining: 0,12mm. The machine comes in two wooden boxes and weighs in total approx. 1.900kgs. Every common transportian method (airfreight, truck, vessel…) can be used to get the machine on every location all over the world. Thanks to our shipping partners the machine can be on it’s way within 24 hours (Time can differ in reference to specific regulations of some countries). 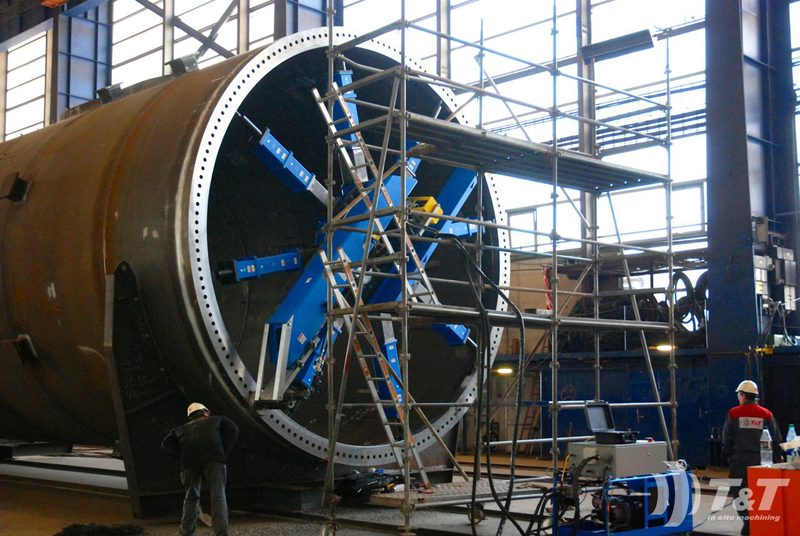 Machining of two flanges, Ø6.000mm each, with the circular mill FFM6500. Overall flatness after machining: 0,17mm and 0,16mm. Machining of both flanges within 24 hours. Even though the machine weighs approx. 6.5 tons, separated in four wooden cases, the FFM6500 can be shipped with all common transportation method and used worldwide. Boring out small bolts? Spindling of larger bore holes? The right machine is ready for each job! Continuous machining of Ø 35mm – Ø 2.000mm with just three different machines! In addition to normal spindle work, without a lot of modifications the same machines can make cones, mill surfaces, or groove circumferential slots. Only the rotating arm has to be replaced. Thus, the necessary processing and equipment downtimes are drastically reduced. Because, as a rule, only one kind of machine is needed for a job, freight costs are kept as low as possible. Only those parts are sent which will actually be used on-site; no accessories or add-on components which will not specifically be used to accomplish the work are chosen. Linear conductors and recirculating ball screws are only two terms common to our technical status quo. Two machine beds set up exactly alike in two different lengths are enough to cover an endless number of possibilities for mobile milling operations. Thanks to the use of laser measurement technology, we manage to create a virtual reference level before the work begins in which our machines can configure time and again. Thus, putting the milling machine into operation on a large machine foundation becomes very simple. Horizontally, vertically, or over the head, the position of the machine doesn’t matter. The choice of chucking is made in close cooperation with our customers, depending on the on-site requirements in accordance with material specifications, and, if necessary, by us, our partners, or by our customers themselves. Innovative laser technology measures bearing channels of motors very precisely. The advantage: possible deviations of the required axis position are more visible, and can be corrected properly through mechanical machining. 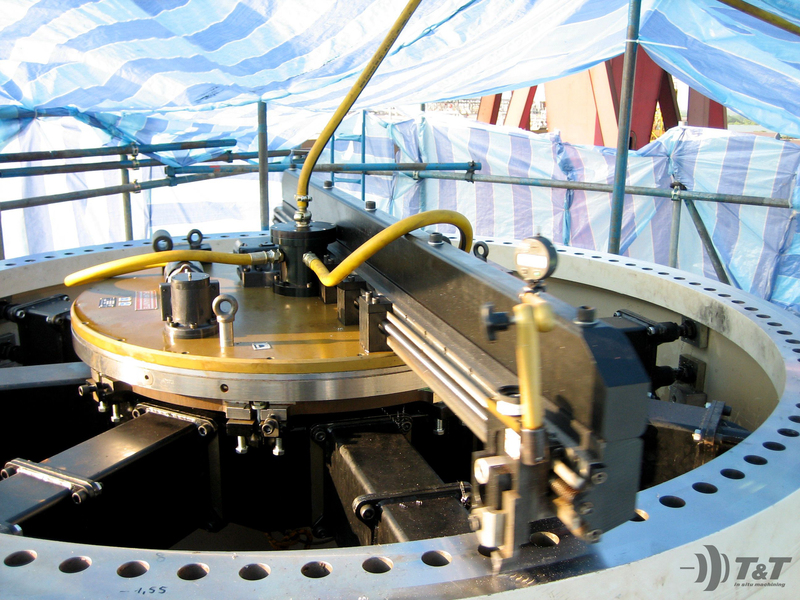 “Measuring” nd“machining” utilize the same laser measurement data, therefore ensuring the greatest precision. Disturbing noises, vibrations, increased wear or energy use are only a few of the things which, through the use of the most modern laser measuring technology, can be eliminated or at least reduced quickly and easily. In close cooperation with the manufacturer of the laser measuring equipment, we continually develop our laser measuring system further, and then integrate these developments perfectly in our mobile machine tools. We can chock your machines and installations no matter what the size. With the use of Epocast® 36, uneven base and floor areas can leveled simply and economically. In the installation of main engines, including auxiliary equipment, such as motors, gear boxes, generators, compressors, stone mold insertion machines, paper machines, slewing bearings, pressure or thrust bearings this 2-component casting resin offers an adequate substitute for the conventional steel fitting pieces which, in mostly lengthy processes, must be scraped manually. In addition, Epocast® also reduces noise and vibrations in comparison with conventional alternatives.